I wanted to share some (new to me) protein/snack bars that are different than your usual/traditional protein bars. These all taste delicious and are made from clean ingredients, no splenda/suralose which is a chemical I avoid in all my foods. I've written about splenda before. I know everyone loves their Quest bars, but take a closer look at their ingredients. It has whey isolate and Isomalto-Oligosaccharides (a fake fiber), I don't like to eat processed food. I still make my peanut butter coconut balls, linked below, every month. These 100 calories bars are my favorite low-calorie snack. It's primarily made of chia seeds and coconut but comes in a variety of flavors. My favorite flavors are the regular coconut, the dark chocolate and acai berry. They often go on sale at Whole Foods or you can buy them online. They have 3g of protein. They are made up of only four ingredients: egg whites, fruits and nuts. You can find it at Trader Joe's, Whole Foods or online. They are 200 calories and 12g of protein. These bars are soft chocolate-coated cakes. The first ingredient is coconut nectar so that's what the insides are primarily made of. They are 230 calories and 11g of protein. The only flavor I don't like is Mint, it tastes like a too strong girl scout cookie. You can find it at Whole Foods or online but don't purchase online in the summertime because the chocolate will melt. I got turned on to these at the barre studio I take classes at. This meal bar is 290 calories and my favorite flavor is the Almond Coconut which has cranberries in it. They have 8g of protein. You can find them at Whole Foods, 7/11, Target or online. The square bars sound delicious! 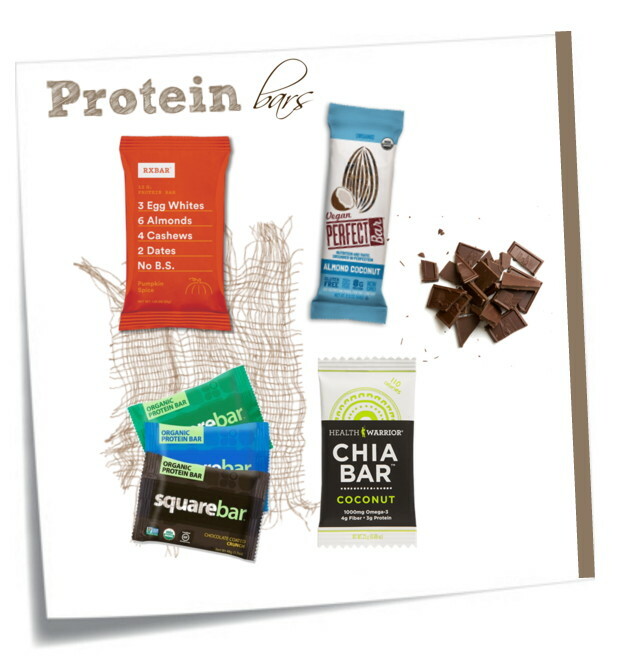 I'm weirdly picky about bars, I hate fruity ones... love these recommendations on some more natural, clean bars! So hard to find. Thanks for sharing these amazing proteins bars... I have never tried any of them! I will have to look into getting some! I've been looking for good protein bars to start carrying around with me because I get such low blood sugar between meals. Thank you for the recommendations! I'm always looking for bars to have with me. SO far I've been buying a lot of Quest bars. I"ll have to try these as well.